Kenneth Feinberg, who oversaw the $7 billion compensation fund for Sept. 11 victims, said the fund was "unique in American history." NEW YORK (CNNMoney) -- The terrorist attacks of September 11, 2001, were unprecedented, not only in their intensity and devastation, but in the way Washington responded. Eleven days after the attacks claimed more than 2,700 lives, Congress created a $7 billion fund to compensate 5,562 family members of the fallen. Payments went to widows and widowers, children and parents. 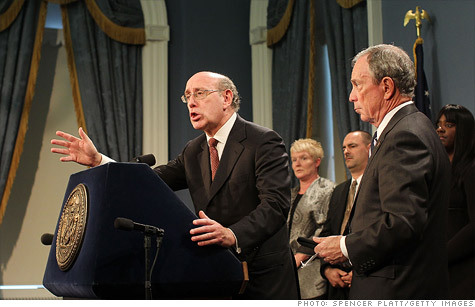 Kenneth Feinberg, the lawyer who was appointed as special master of the September 11th Victim Compensation Fund, told CNNMoney that the fund was "unique in American history," much like the attacks themselves. The speedy creation of the fund, which required the cooperation of lawmakers on both sides of the aisle, seems particularly dramatic when compared to the current brinkmanship over the budget. Feinberg believes that a fund of the type and magnitude of the September 11 Victim Compensation Fund will never be repeated. "Bad things happen to good people every day in this country and it's not part of our heritage for the taxpayer to be an insurer," he said. "To give these people, on average, $2 million tax free flies in the face of American history." The payment for death claims averaged $2,083,000 for families, while compensation for injury claims averaged $400,000. The purpose of the September 11 fund was to compensate the family members of the 2,753 victims who were killed by al Qaeda terrorists who hijacked four commercial airliners and crashed three of them into World Trade Center and the Pentagon. The fourth plane went down in Pennsylvania when the victims rebelled against their captors. The fund closed in 2003, but President Obama reactivated it earlier this year. The new fund, called the Zadroga Act, was created out of concern that some victims, particularly first responders, became ill or died from exposure to toxins at the attack sites years after the fund closed 2003 . Feinberg said the congressional motive behind the original fund was "to demonstrate our solidarity and our compassion and sympathy for the victims." But it had another critical mandate: To protect the airline industry from tanking and taking the U.S. economy down with it. Before the victims' families could receive funding, they had to agree to not sue the airlines. 0:00 / 3:41 Building the World Trade Center - twice! "After 9/11, there was a fear that commercial airlines were going to shut down," said said Lloyd Dixon, senior economist for the Rand Corp., a public policy think tank. "[The fund] certainly was an act of passion and an act of being united as a country. But it was also united by this concern that if they didn't do something about broader liability, then the economy was going to be in trouble," he said. Donald Migliori, a lawyer representing survivors who elected to sue the airlines, said the airlines should be held accountable for the security lapses that led to the attack, and that victims should be compensated with money from the airlines, not from the government. Migliori represented 56 of the 95 victims who settled with the airlines for a total of over $500 million. One of his clients is the only victim still pursuing a claim against the airlines. Mary Bavis, who had a son on the doomed United flight, has a lawsuit against the airline which is scheduled for a hearing on Nov. 7 in federal court in New York City. For those families who did take a payment from the 9/11 fund, the size of their settlements differed widely, depending on whether the victim was a firefighter, a dishwasher or a corporate executive. Compensation started at $250,000 for relatives of the lowest-paid breadwinners -- those who earned up to $20,000 per year. Payments for victims in the highest salary bracket of $220,000 or more were much higher; some families received as much as $7.1 million. Determine the economic loss suffered as a result of the victim's premature death. Add that number to an estimate based on pain and suffering, and emotional distress. Subtract from that number any collateral source of income due to the survivors -- like life insurance. Feinberg detailed the disparity of incomes in his book, "What is Life Worth? The Unprecedented Effort to Compensate the Victims of 9/11." He wrote about meeting with "poor, humble families from South America, who did not even speak English" who were related to kitchen workers who died in the World Trade Center. They stood in stark contrast to the "investment bankers who made millions of dollars each year." "One of the controversial things that [the fund did] was tie compensation to incomes of those killed or seriously injured in the attacks," said Rand's Lloyd Dixon. "So some people received far more compensation than others." There was no such government compensation for other terrorist attacks, like Timothy McVeigh's 1995 bombing of the Alfred P. Murrah building in Oklahoma City that killed 168 people. Nor have there been funds for devastating natural disasters, like Hurricane Katrina, which ravaged New Orleans and other parts of the Deep South in 2005, killing more than 1,700 people. Obama reactivated the new 9/11 fund in January, when he signed into law the First Responders Bill, also known as the James Zadroga 9/11 Health and Compensation Act. The act set aside $4.3 billion in federal funds to cover all costs for treating certain 9/11-related illnesses among first responders and survivors and to provide compensation to victims. Of that amount, $1.5 billion will go to cover health costs, while $2.7 billion is set aside for payouts to people who suffered economic losses tied to a physical injury or the loss of a family member. And according to Sheila Birnbaum, the lawyer who is the special master of the Zadroga fund, it too requires beneficiaries to sign on the dotted line, just like the original fund. "There is the same requirement," she said. "You have to agree not to sue anyone, not just the airlines." -- CNNMoney senior writer Parija Kavilanz contributed to this story.